The role of universities in either fostering or limiting social activism is the topic of a campus forum to be held at the Erb Memorial Union. 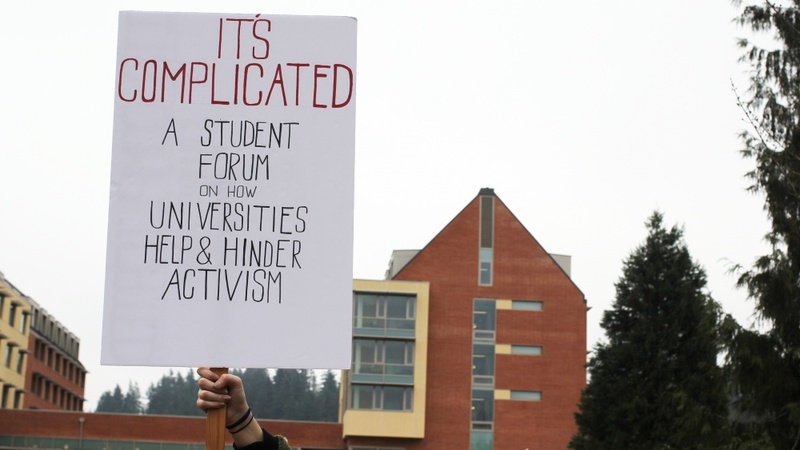 “It’s Complicated: A Student Forum on How Universities Help and Hinder Activism” will provide an opportunity for students to discuss campus engagement. The event will take place from 4-6 p.m. Wednesday, Feb. 8, in Erb Memorial Union’s Redwood Room. Universities have long served as places for, as well as targets of, activism. However, there is little shared knowledge about what universities offer to either help or hurt that involvement, according to Michael Musheno, a UO law professor who is organizing the forum to help fill that gap. The forum will be separated into three parts. In part one, the student panelists answer a set of questions from their own perspective. In part two, no distinction is made between presenters and audience; rather, the entire group engages the questions together. In part three, no one facilitates the discussion and conversations continue among individuals. The perspectives and information shared at the event will not benefit just the participants. Musheno hopes to put the knowledge to work in interacting with freshmen who join the Academic Residential Community for Social Activism this fall. Lexi Bergeron, a student activist who has served as the academic residential community assistant for the LGBTQIA+ Scholars. Isabel Courtelis, a volunteer coordinator at the ASUO Women’s Center, a research assistant for legal studies and a member of the Dis/Oriented Film Collective. Alexandro Fierro-Stephens, co-director of the Multicultural Center and a peer advisor at the Center for Multicultural Academic Excellence. Daniel HoSang, associate professor of political science and ethnic studies, as well as head of the Department of Ethnic Studies. Perla Alvarez Lucio, co-director of the Multicultural Center and first-generation Xicana passionate about community organizing, social justice, reproductive justice, youth involvement and activism. C.J. Pascoe, associate professor in the UO Department of Sociology, where she teaches courses on sexuality, masculinity, social psychology and gender. Jennifer Reynolds, associate professor at the UO School of Law whose current research centers on activist methods and alternative processes, and whether and how law schools can meaningfully support community activism. The event is sponsored by the Wayne Morse Center for Law and Politics and UO Law’s Appropriate Dispute Resolution Center. It is co-sponsored by the ASUO, Black Law Student Association, Graduate Teaching Fellows Federation, Holden Center for Leadership and Community Engagement, OUTlaws, Peacejam Northwest, Undergraduate Legal Studies and the ASUO Women’s Center.